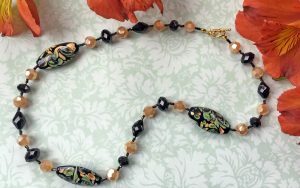 We love the look of broken china mosaic. It makes us think of English gardens, tea parties, and grandma. 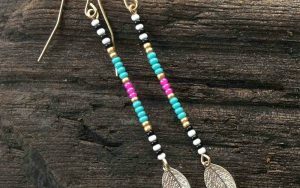 So we’re delighted to share one of our favorite projects with you. A Broken China Mosaic Birdhouse! 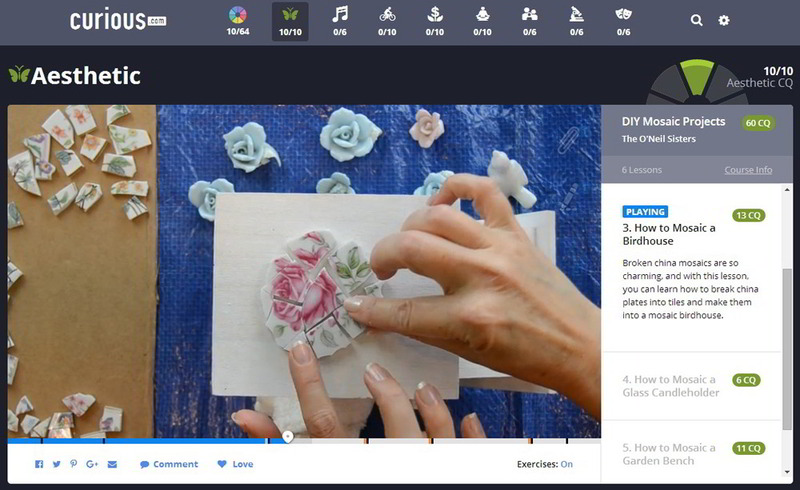 We have the complete step-by-step instructions for this project below, including two videos showing how to cut china. But if you want a little more help in making it, we have a complete video lesson for it on Curious.com. Our Broken China Mosaic Birdhouse lesson on Curious is 25 minutes long and broken down into sections. 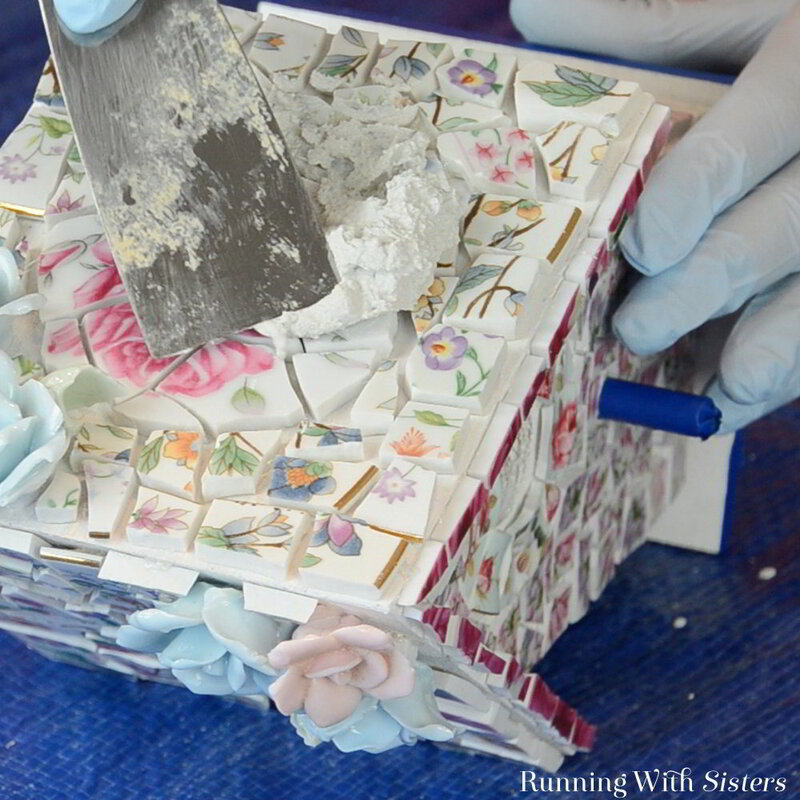 In the class, we show you all the tools and materials you’ll need, how to use tile nippers and wheel cutters, how to arrange the tiles into your design, how to glue the china pieces down, how to mix the grout, how to apply the grout, and how to buff your birdhouse mosaic. 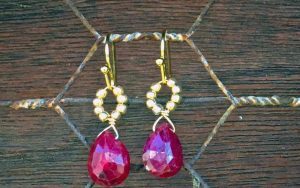 The lesson is fun and filled with extra tips and tricks! Click here if you want to see the complete video lesson. 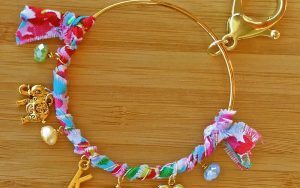 And here are the complete instructions to make your own! 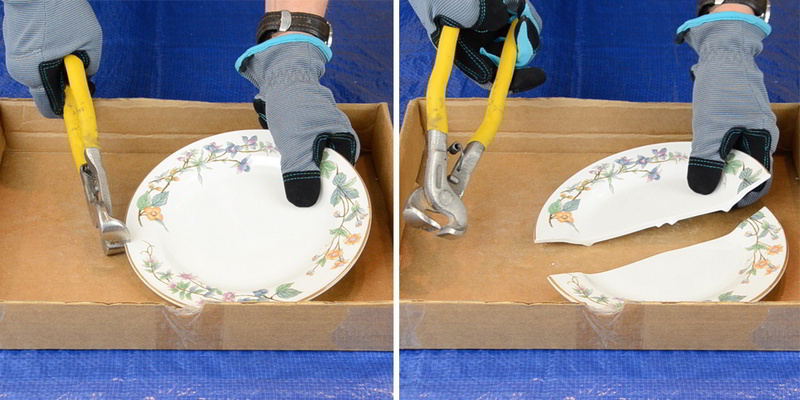 To do this, wear your safety gloves and glasses and place each plate in a Ziploc bag. Use the nippers inside the bag. Grip the edge of the plate with the nipper blades perpendicular to the edge of the plate. The nippers only need to nip 1/4″ to 1/2″ into the plate. Hold the plate with one hand and bend the plate against the nippers as you squeeze them onto the china. They will create a crack and break the china into two pieces. Repeat to break the larger pieces into smaller pieces. The nippers work well to get big cuts, but use the wheel cutters for more precise cutting like cutting out roses. 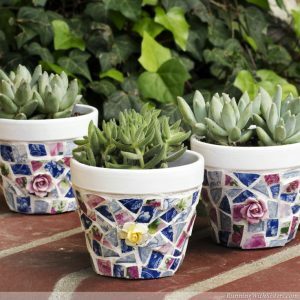 To keep a large area of flowers together while you cut it into smaller tiles, tape the front first with clear packing tape. Use the wheel cutters to create breaks in the design so you can reassemble it on the birdhouse. To chisel the roses off your knick-knacks, make a bed of bubble wrap and cover it with the towel. Wear your safety gloves and glasses. Nestle the knick-knack into the towel so it doesn’t move easily. Hold the chisel with one hand and aim the chisel edge up under the rose. Strike the end of the chisel with the hammer in your other hand. It may take more than one blow. Prime the birdhouse and let it dry. Mask off any areas that you don’t want to grout, like the entry hole. 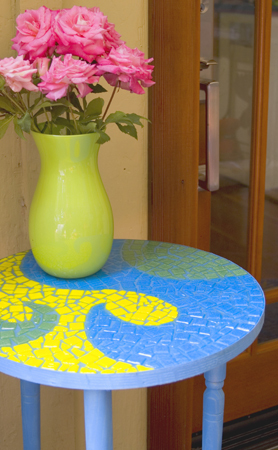 Lay out your mosaic design by starting with the china roses you chiseled off the knickknacks. Set two or three roses on the top edge of the roof. Set the large flower design you taped together in the center of the roof. Arrange china pieces to cover rest of roof. Glue each piece down. Repeat to mosaic other side of roof. 4. 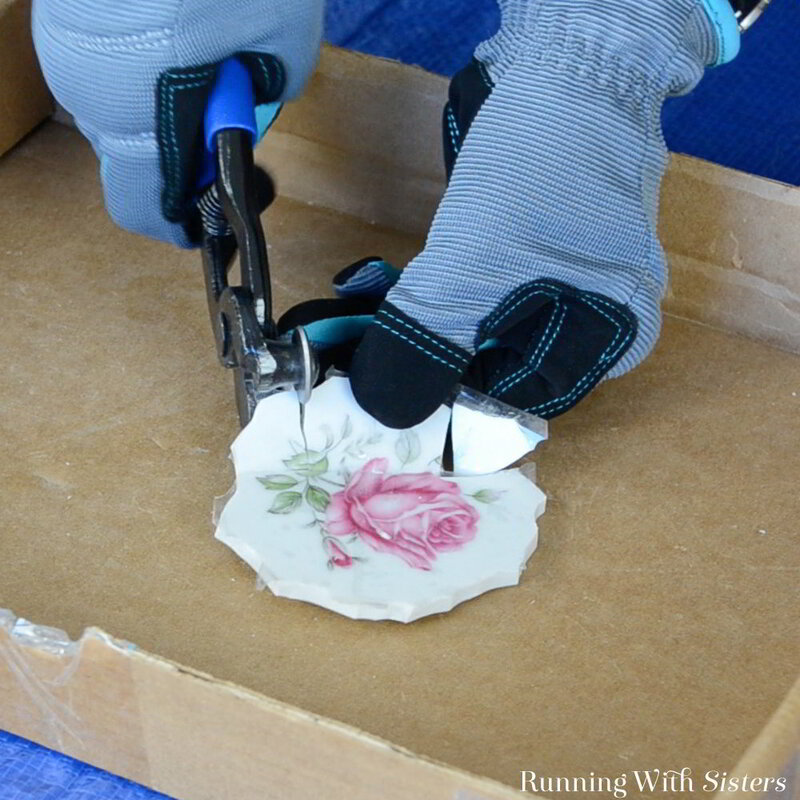 For the front entry hole of the birdhouse, arrange special china pieces, cutting them to fit with wheel cutters as needed. Glue in place. Cut pieces to fit the eaves and glue into place. Cover rest of front of birdhouse with china pieces and glue into place. Repeat for sides and back of mosaic. 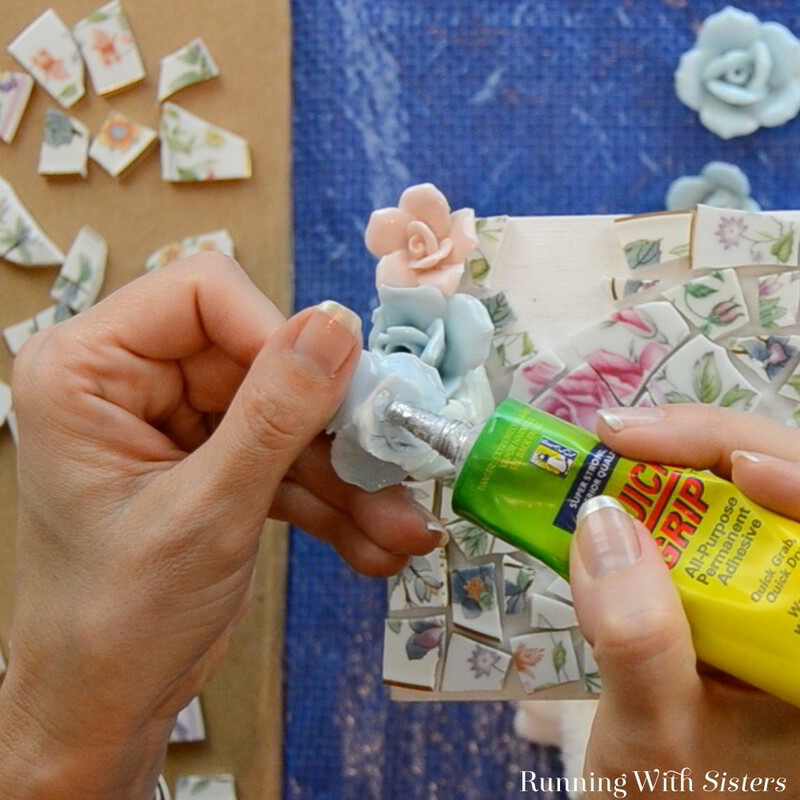 Let glue dry. 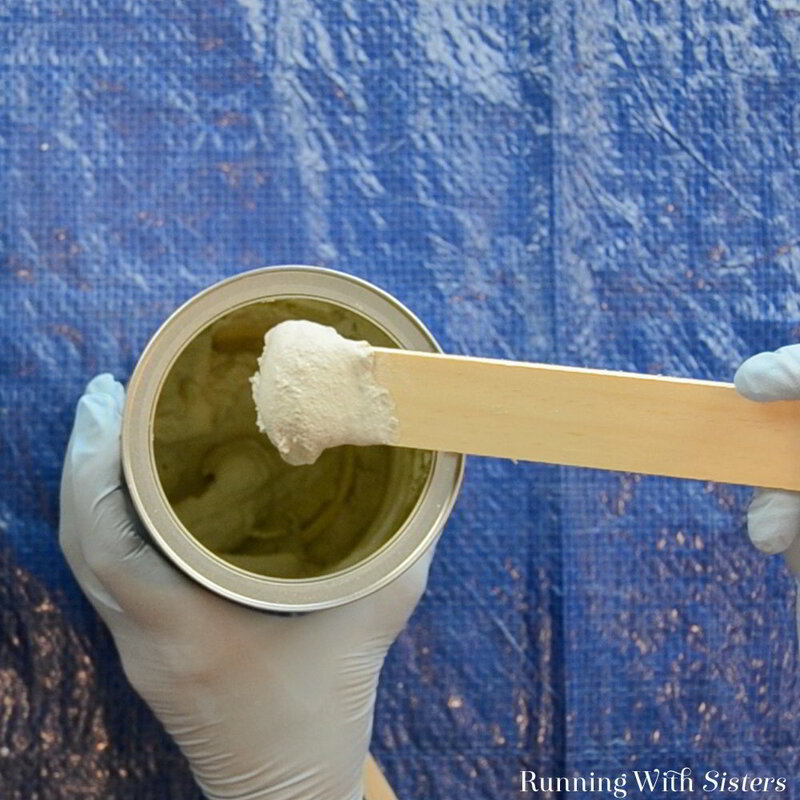 Blend the grout and water in the coffee can using the stirring stick until it is the consistency of runny peanut butter. The grout stays workable for about 15 minutes, so get ready to grout the mosaic. 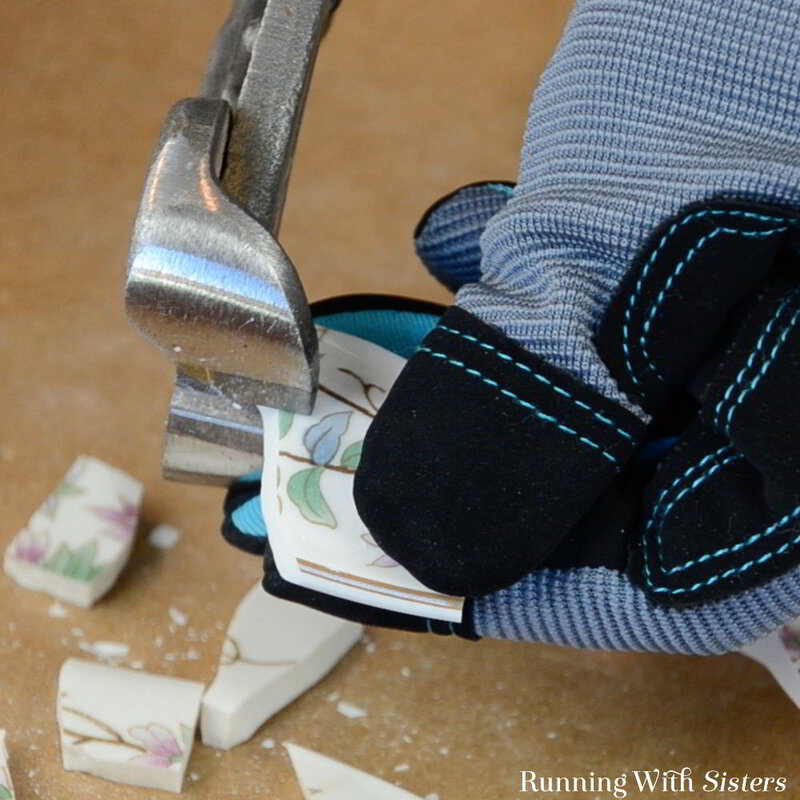 Spread the grout onto the surface of the mosaic right over the china pieces. 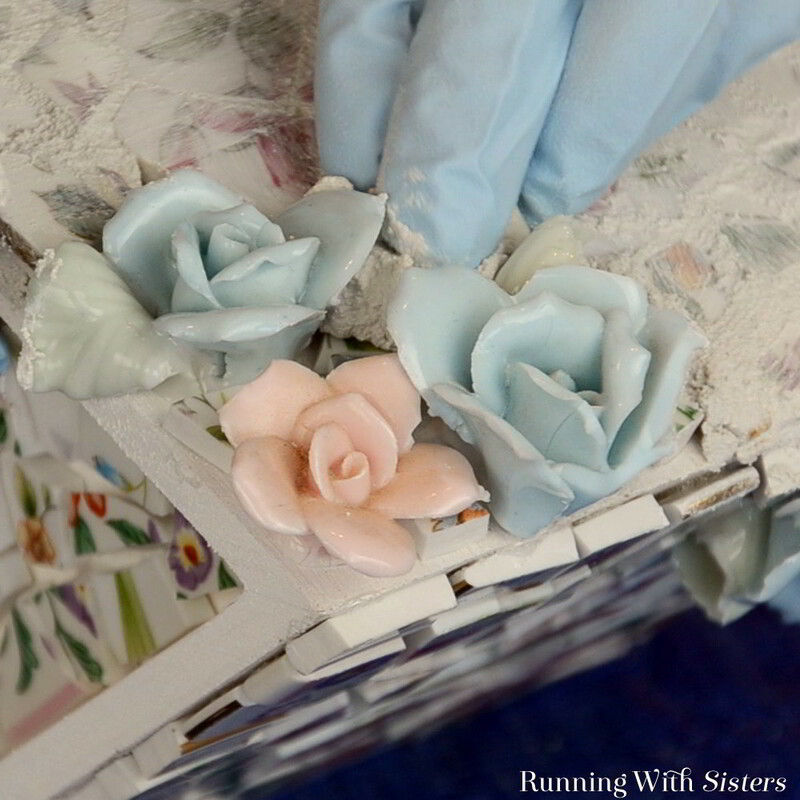 Use a sponge or putty knife to spread the grout around all the china pieces and roses. Make sure you apply the grout around the outside edges and in between each and every tile. 7. Repeat to grout each side of the mosaic. Then let dry for 30 minutes. Check on the grout as it is drying and spray it with a mist of water if there are any areas that look like they are drying faster than the rest. This will prevent cracks. 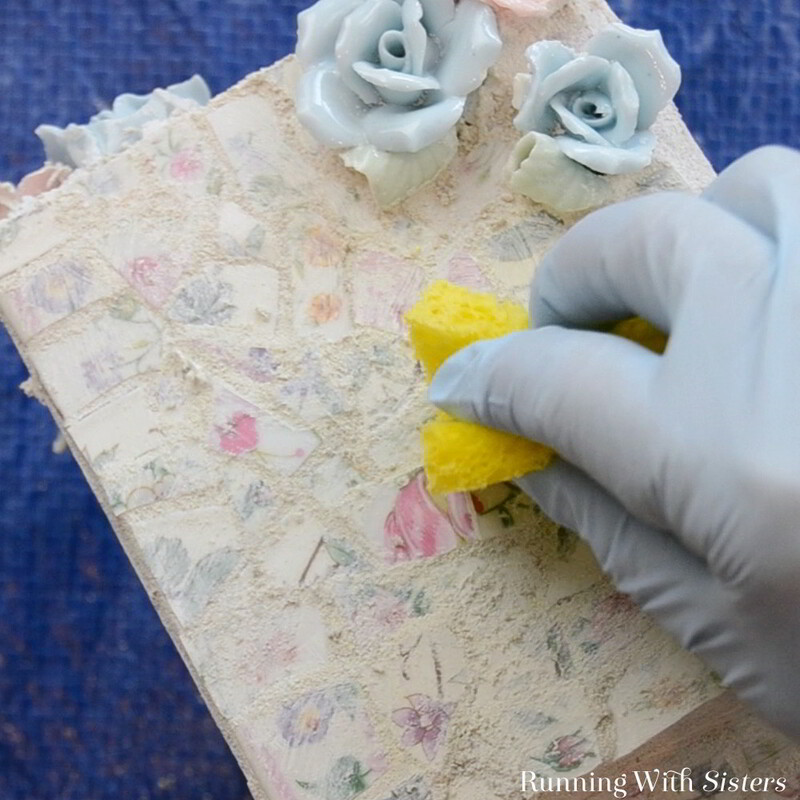 After 30 minutes, use a paper towel or damp sponge to wipe the grout haze off the china pieces. Be careful not to remove the grout from between the tiles. 9. Wait another 30 minutes and buff the haze again. Repeat if necessary. Let the grout dry for 24 hours then seal the surface with grout sealer and a sponge paintbrush. Let dry. 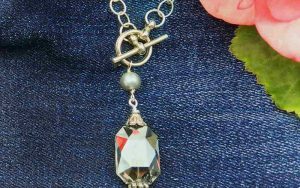 We love how this project turned out. So pretty! 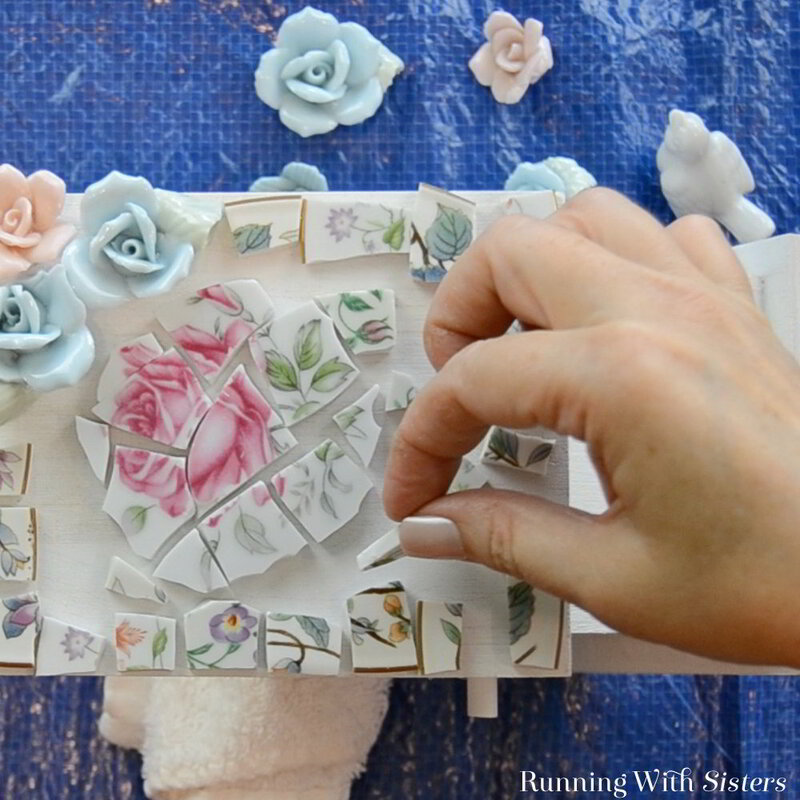 We hope you are inspired to make your own broken china mosaic! And remember if you need any help or info, just leave us a comment and we’ll reply! 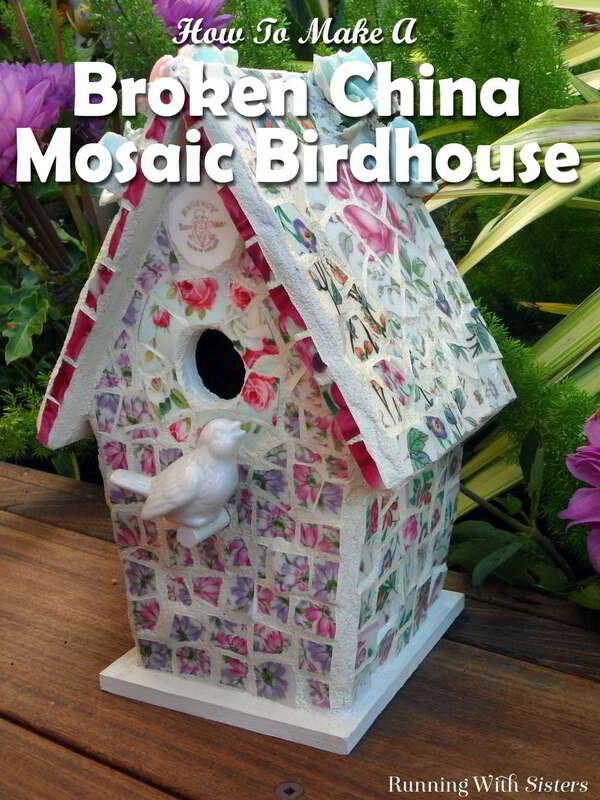 Share this Broken China Mosaic Birdhouse. We love getting Pinned! A quick question, I’m looking to do a chicken mosaic on the side of my chicken coop. Can I use the same technique? I already have 5 boxes of broken porcelain that is weather proof. 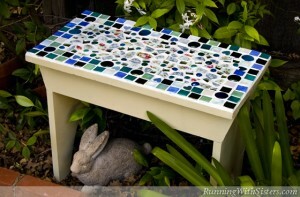 You CAN NOT mosaic on wood and leave it outdoors. Wood expands and contract and eventually all your lovely, hard work will be ruined. You can seal wood all you want, but it will still expand and contract and those tiles WILL eventually crack off. Though the birdhouse and bench are darling, they will be or already have been ruined by the outdoor elements. Thanks Cindy. You are so kind to add this tip! 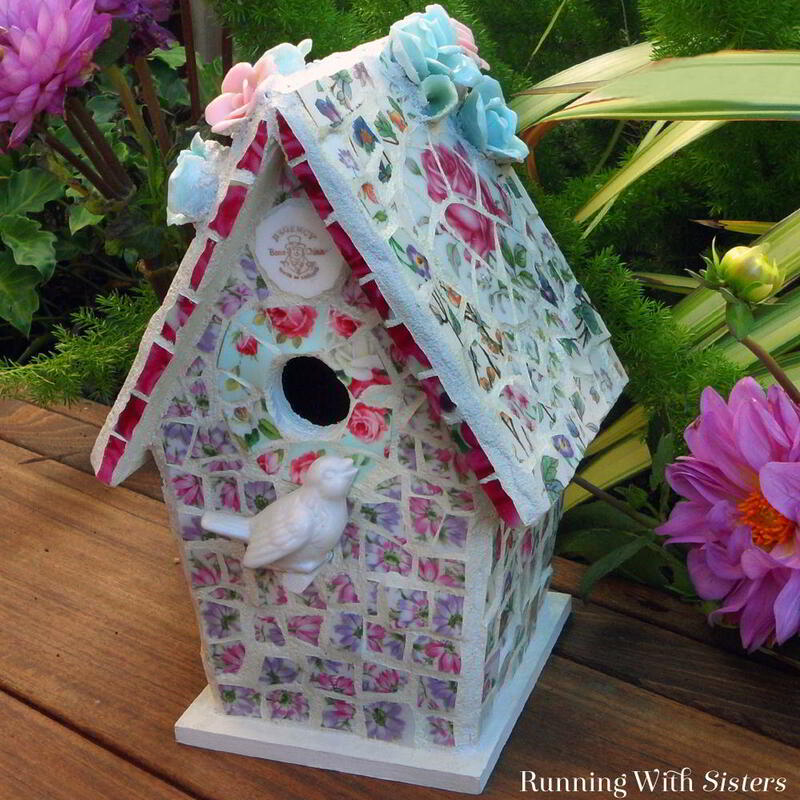 I have a birdhouse (thick wood from craft store) that I have mosaiced and covered with grout like weathered stucco. It’s been out on top of fence post for over 5 years. I have birds (Carolina Chickadees) nest in it every year. I clean out when they have left the nest. I have not seen any damage to the wood. I don’t expect it to last forever but it has given me (and the birds) plenty of pleasure…and a comfy home 🙂 thank you for the lesson and sharing your beautiful work. Mosaics are so much fun!!! Love the idea. Can the birdhouse be used for birds outside? We have our Broken China Mosaic Birdhouse outside in an area that doesn’t get rained on. No birds have peeked in yet. But, we also have a garden fence with birdhouses all over it. (The decorative kind you can find at Michael’s and Homegoods.) And we had Bewick’s Wrens nesting in one of the birdhouses last year! It was a decorative mosaic birdhouse very similar to ours. And they thought it was just fine! have a birdhouse (thick wood from craft store) that I have mosaiced and covered with grout like weathered stucco. It’s been out on top of fence post for over 5 years. I have birds (Carolina Chickadees) nest in it every year. I clean out when they have left the nest. I have not seen any damage to the wood. I don’t expect it to last forever but it has given me (and the birds) plenty of pleasure…and a comfy home ? thank you for the lesson and sharing your beautiful work. Mosaics are so much fun!!! In loving your site. You two are SOOO talented! I am finally ready to try my hand(s) at mosaicing! (a word?) Haha. Your tutorials have been a great help for a beginner. Thank you so very much!